People are talking about how productive Middle Valley Pumpkin Patch has been this year! The orange fruit has been springing up all over the field and not just little round ones that'll work well for Jack-O-Lanterns, oh no! The long-held record for biggest pumpkins at the County Fair was already crushed in late August. Now that it's nearing October the size of some of these pumpkins seem almost. . . freakish! One has to wonder why the usually mediocre farm, Middle Valley Pumpkin Patch, is doing so well. Have they started a new watering schedule? Did they plant at the perfect time? Or maybe, just maybe, they've been using some unconventional and dare we say, evil, fertilizer. The Middle Valley rumor is that they found a spooky stash and used it on their farm this year. The rumor might seem far-fetched but it would explain the strange sightings of what Middle Valley citizens are calling The Nightmare Pumpkin Man! This amazing costume will turn you into the Nightmare Pumpkin Man. It comes with a long flowing robe (with a see-through section in the middle) and a super-sized pumpkin mask. It has an inflatable height extender and inflatable arms, along with super creepy hands. 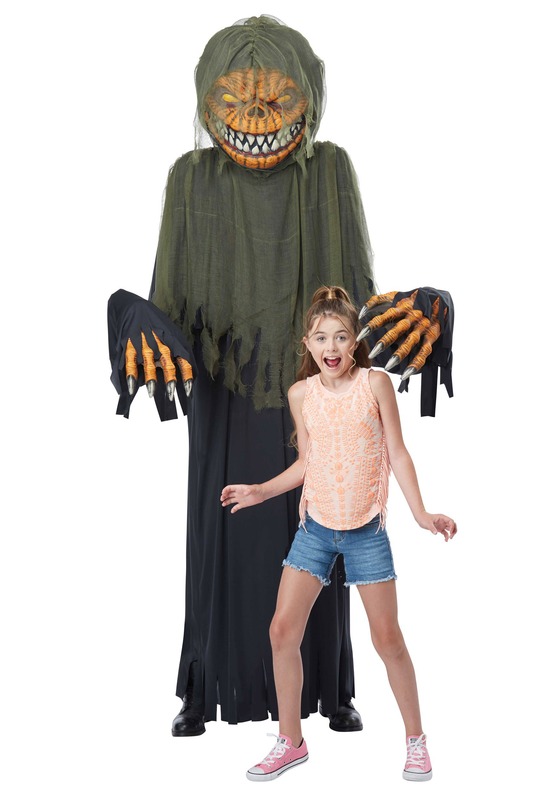 When you're in this costume, you're sure to be quite the terror, but, it also comes with a cord so you can hang it from a tree and use it as super-sized decor! You won't need fertilizer made from dusty mummies to bring a Towering Terror Pumpkin to your town. You're sure to cause some walloping screams when people see clawed over-sized hands and the wrinkled head with orange and yellow eyes and a wide toothy grin. You'll reach eight feet tall and be draped in a freaky green gauzy fabric and a black robe. We're sure you'll have quite an impact on any trick-or-treaters that venture into your yard!